Click here to visit the Coupons site and you’ll be able to print a coupon good for $1.50 off on any TWO (2) Purex Liquid or UltraPacks Detergents. You can click the back button to print a second one. 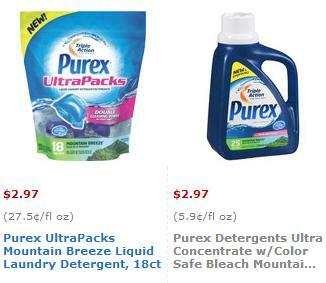 Walmart has the Purex liquid and UltraPacks detergent for as low as $2.97, so you can get 2 for $4.44 after this coupon – making them $2.22 each.